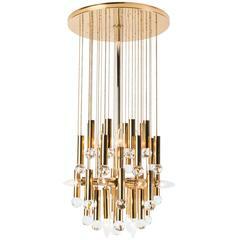 Mid-Century Modern "crown" pendant in gilded metal with 3 tiers of tear-drop crystals. The pendant has a single socked (newly electrified for the USA) original stem and canopy. 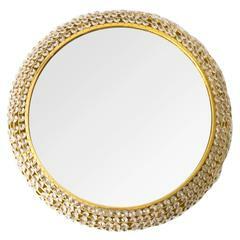 Measure: Height 33.5", diameter 13". Made by Ernst Palme, Westheim, Germany. 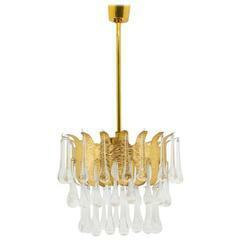 Ernst palme glass and gilded brass chandelier, Germany 1960s, Palwa. Very good condition. Worldwide shipping. 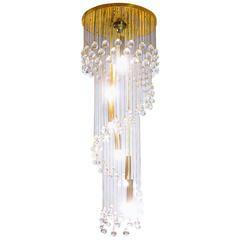 This sconce from the 1960s was designed by Ernst Palme for Palwa and is made from gilded brass and crystal glass.